On this date in 1980, a professor, a soldier, a bureaucrat and a businessman were hanged by Saddam Hussein in his campaign to cow Iraq’s Turkic ethnic minority. The ethnic and religious quiltwork of Iraq is much more nuanced than Sunni vs. Shia — and this blog has noticed its deadly potential before. Nejdet Kochak, Abdullah Abdurrahman, Riza Demirji and Adil Sherif were ethnic Turkmen (or Turkomen), ethnically and linguistically distinct Moslem descendants of those far-flung peoples of the Eurasian steppes. More to the point, they were relatively prominent voices for Turkoman civil rights in the face of harsh state suppression. This being Saddam Hussein’s Iraq, the problem had an easy solution. 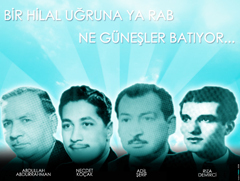 The four were made examples of, convicted of spying for their brother Turks in Turkey, and hanged — but not forgotten.